While it's awesome to go on huge, fancy, expensive vacations sometimes it's nice to take a smaller trip. You don't have to travel as far. Since you're driving the costs can been kept lower. There are so many perks to the local vacation or stay-cation. 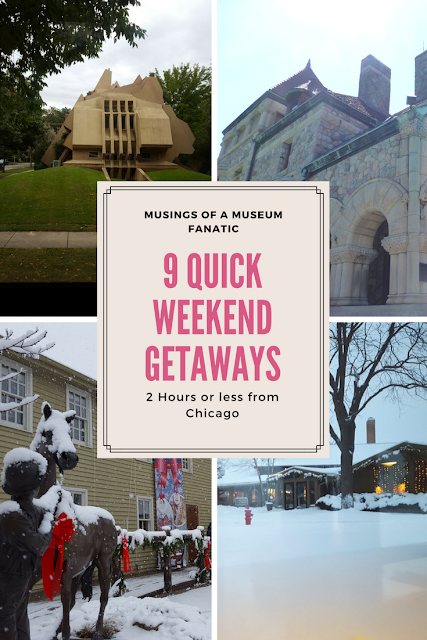 Being in the Chicago area and the upper Midwest there are so many wonderful options that are just a couple of hours away. I'll be focusing on trips that are two hours or less from downtown Chicago. Lake Geneva is a wonderful resort area with so many different options for all seasons and all budgets. We really enjoyed our December long weekend in Lake Geneva even though the weather kept us inside. Many a Chicagoan heads to Lake Geneva for a long or short weekend getaway. The other city on the lake to our north, this city if full of fun and great times. There are awesome museums, breweries and great restaurants. When we went several years ago for the Zelda Symphony concert we were able to hoof it all around downtown without even taking our car out of the garage. Milwaukee gives you a lot of the same things you love about Chicago but in a smaller more manageable city for those who aren't really city people. I'm partial to South Bend these days since my best friend has been living there. It's got a college town and small city vibe all rolled into one. We've enjoyed hanging out in the very nice downtown area, killer brunch at a fantastic historic mansion and for those beer fanatics it's the home of Evil Czech brewing. This one brings me back to college. With The Dunes being just down the road from Valpo we went there several times while in school. They are a perfect vacation for the outdoorsy type. You could even do this as a day trip from Chicago since it's only an hour. This is the closest weekend getaway you could have without actually staying in the city. There is so much to see in Oak Park it's ridiculous. For me it's all about the architecture when I think of Oak park. With Frank Lloyd Wright all over the place you know you're going to be seeing some amazing buildings for sure. Be sure to check out the newly restored Unity Temple. A favorite of my friends Starved Rock is an easy day trip but stay at one of the lovely hotels right in the area or even in the park at the Starved Rock Lodge to make it a full weekend. There is all sorts to do and see. Top of my list would be the Fall Colors trolley tour from the Starved Rock Lodge. I can only imagine how beautiful the colors are! This area has become the Napa of the Midwest with many a vineyard and winery. A quick wine weekend getaway to this area is the perfect way to unwind. These two great towns right on the eastern shore of Lake Michigan are ideal for relaxing and enjoying yourself. If you're visiting in the summer this area is also known for berries so be sure to find a great pick it yourself place. Since I grew up pretty much in Naperville it seems a bit odd to recommend it as a weekend get away! With the new Hotel Indigo that's now open in downtown Naperville right on the riverwalk it makes a great downtown area a perfect weekend getaway. I've always loved just wandering up and down the riverwalk. There are tons of great shops and restaurants to check out. Be sure to stop by Naper Settlement, it's a must on my list!